Kennedi Miller dribbling up the court directing her teammates where to go for the play. Four-year varsity letterman for the Lady Chiefs basketball team, Kennedi Miller, was awarded with Athlete of the Week. Basketball has been a huge part of Miller’s life for about 12 years now. She began playing basketball when she was six years old. Miller’s pregame ritual includes hanging out with her teammates and listening to music in order to get in “game mode”. When she isn’t playing basketball, Miller enjoys playing “The Sims” and watching “The Haves and the Have Nots”, her favorite show. 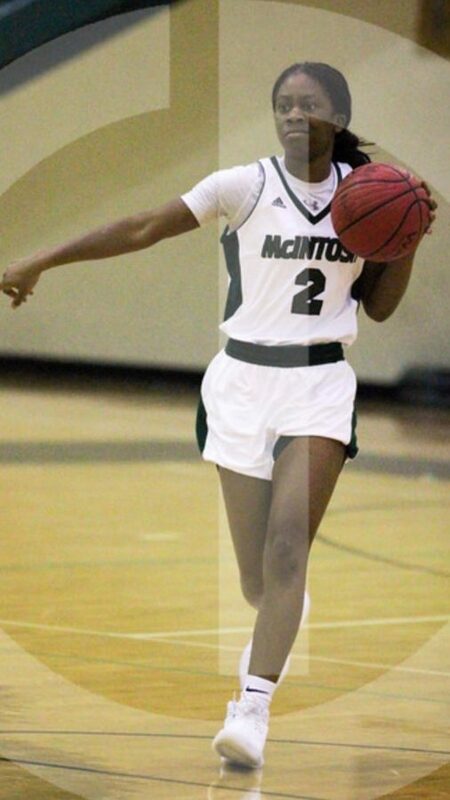 With this being her last year playing for the McIntosh coaching staff, Miller has enjoyed how they always hold the team to high standards and have the team’s best interest in mind. Miller is most going to miss the game day atmosphere and the student section once the basketball season is over. “I love going out there and playing every game like it’s my last,” said Miller. Although she’s never played any other sport, if she had to play another sport besides basketball, Miller would run track because she’s always been interesting in watching it. As any athlete may know, there are many times for ups and downs in sports. Miller had a setback of her own. “When I got injured my freshman year, it made me gain mental toughness I never thought I had,” said Miller. After many years of playing, Miller has learned how to deal with different personalities and intends on taking that with her into the real world. Miller will be graduating in May along with her teammates, Anna Muh and Rylee Calhoun. She will be attending Georgia State University and plans on being a business major. The remaining schedule for the Lady Chiefs include playing at Riverdale High School on January 25 and playing at Griffin High School on January 29. Senior night for Miller, Muh, and Calhoun will be on February 1 against Jonesboro High School.